Skrímslin í Færeyjum: Upplifunarsýningin Skrímslin bjóða heim opnaði 1. apríl í Norðurlandahúsinu í Þórshöfn í Færeyjum. Þá hófst einnig barnamenningarhátíð Norðurlandahússins, Barnafestivalurin 2017, sem stóð til 9. apríl með metnaðarfullri dagskrá og viðburðum: tónleikum, list- og leiksýningum. Sýningin um skrímslin tvö er farandsýning og var upphaflega sköpuð fyrir Gerðuberg menningarhús. Við hönnuðir sýningarinnar fylgdum henni til Þórshafnar og unnum að uppsetningunni ásamt starfsfólki Norðurlandahússins. Þar var sannarlega tekið vel á móti okkur og skrímslaheimurinn sómdi sér vel í bjartri og opinni Forhøll og hlýlegri Dansistovu. Myndirnar sem hér fylgja eru frá opnunardeginum í Norðurlandahúsinu, en börn og fullorðnir virtust una sér afar vel í skrímslaheiminum og nutu samvista við lestur og leik. Það gladdi að sjá því meginmarkmiði sýningarinnar náð. Sýningin verður opin gestum frá 1. apríl til 4. maí. Nánari upplýsingar og myndir frá fyrstu uppsetningu sýningarinnar í Gerðubergi menningarhúsi má sjá á síðunni hér. Um skrímslabækurnar má fræðast hér og um höfunda bókanna og samstarfið má lesa hér. 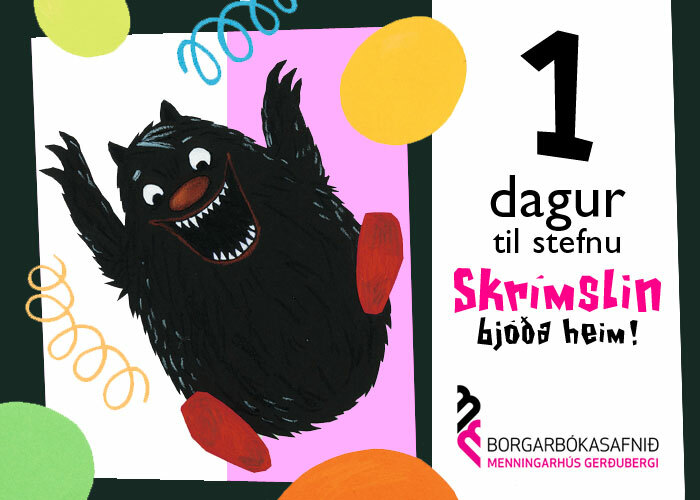 Travelling Exhibition: On April 1st the interactive exhibition for children: a Visit to the Monsters, opened in the Nordic House in Tórshavn in the Faroe Islands, as one of the events at the annual Children’s Festival, Barnafestivalurin 2017. 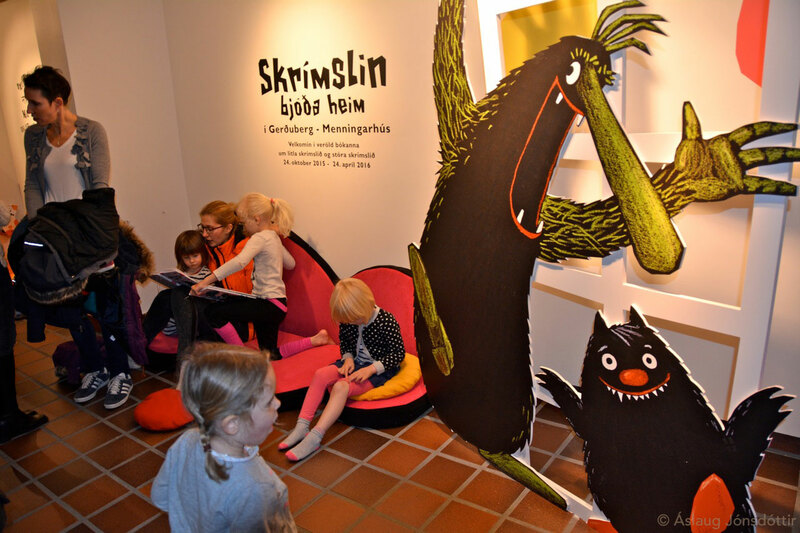 The exhibition is based on the books about Little Monster and Big Monster by Áslaug Jónsdóttir, Kalle Güettler and Rakel Helmsdal. It was originally designed and on display in Gerðuberg Culture House in 2015-2016. Art direction and exhibition design was executed by Áslaug Jónsdóttir and Högni Sigurþórsson – and we two, Högni and I, travelled to Tórshavn to work on this version for the Faroese friends of the monster series. Our good hosts and co-workers truly made us and the two monsters feel at home in The Nordic House in Tórshavn and we certainly enjoyed working in the beautiful elements of the Nordic House. The following photos are mostly from the opening earlier this month. I was delighted to see that both children and grown-ups found pleasure in what the exhibition is all about: reading and playing together. The exhibition is open until May 4th. Further information in Faroese here. See also photos from the first version in Gerðuberg Culture House and read more about the exhibition on the page here. Click on the links to read more about the monster series or the three authors and their collaboration. Við Högni þökkum fyrir okkur! | Happy exhibition designers give thanks for a delightful stay in Tórshavn! Skrímslafundur: Gleðilegur dagur barnabókarinnar er að kveldi komin. Það var vel við hæfi að ég eyddi deginum á ströngum vinnufundi með góðum vinum og samstarfsfólki: Kalle Güettler og Rakel Helmsdal. Við hittumst í þetta sinni í Þórshöfn í Færeyjum og fórum yfir nýjar sögur og handrit að bókum um litla og stóra skrímslið. Við gátum líka fagnað opnun upplifunarsýningarinnar um skrímslin tvö, Skrímslin bjóða heim, sem opnaði 1. apríl í Norðurlandahúsinu í Færeyjum, en ég birti án efa bráðlega myndir frá opnuninni og vinnunni við sýninguna. Monster meeting! April 2nd 2017: I hope you all had a happy International Children’s Book Day! I spent the day accordingly, working on new stories and manuscripts for the series about Little Monster and Big Monster, collaborating with my friends and colleagues Kalle Güettler og Rakel Helmsdal. This time we met in Tórshavn in the Faroe Islands where the interactive exhibition: a Visit to the Monsters opened in the Nordic House in Tórshavn on April 1st 2017. I will most definitely post information and photos from the opening very soon! Skrímsli á ferð: Brátt líður að því að litla skrímslið og stóra skrímslið bjóði færeyskum börnum heim og hreinlega inn á gafl til sín. Upplifunarsýningin um skrímslin tvö verður sett upp í Norðurlandahúsinu í Þórshöfn í Færeyjum á barnmenningarhátíðinni Barnafestivalurinn 2017 og verður opin gestum frá 1. apríl til 4. maí. Nánar er sagt frá sýningunni og hátíðinni hér á heimasíðu Norðurlandahússins, en margar myndir og fleira um farandsýninguna „Skrímslin bjóða heim“ má kynna sér á síðunni hér. Einn þriggja höfunda skrímslabókanna er færeyska skáldkonan Rakel Helmsdal. Hún rekur líka eigið sitt brúðuleikhús: Karavella Marionett-Teatur og hefur sett upp brúðuleik um skrímslin tvö. Rakel undirbýr nú líka pappírsbrúðuleik þar sem hún nýtir myndlýsingarnar mínar úr skrímslabókunum sem efnivið og sprettibókarformið (pop-up) sem leiksviðið. Fyrstu drög má sjá á ljósmyndunum hér fyrir neðan. 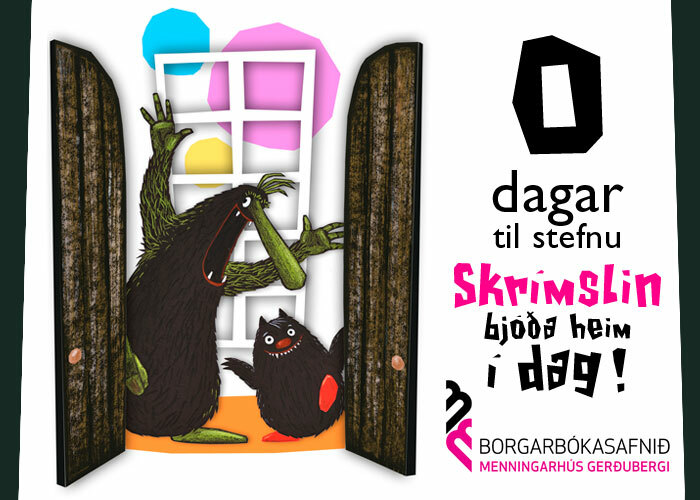 Travelling Exhibition: The interactive exhibition Visit to the Monsters is soon to be opened in the Nordic House in Tórshavn in the Faroe Islands, as on of the events on the annual Children’s Festival. The exhibition will open on April 1st 2017 and is open until May 4th. Further information in Faroese here. The exhibition was originally on display in Gerðuberg Culture House in 2015-2016. See photos and read more about the exhibition on the page here. One of the three authors of the Monster series is the Faroese writer Rakel Helmsdal. She also runs her one-woman puppet-theater: the Karavella Marionett-Teatur and has played a puppet show with Little Monster and Big Monster. She is now preparing a show with paper puppets, basing her images and figures on my illustrations from the books, using the pop-up book art form as stage. The photos below show her first drafts. 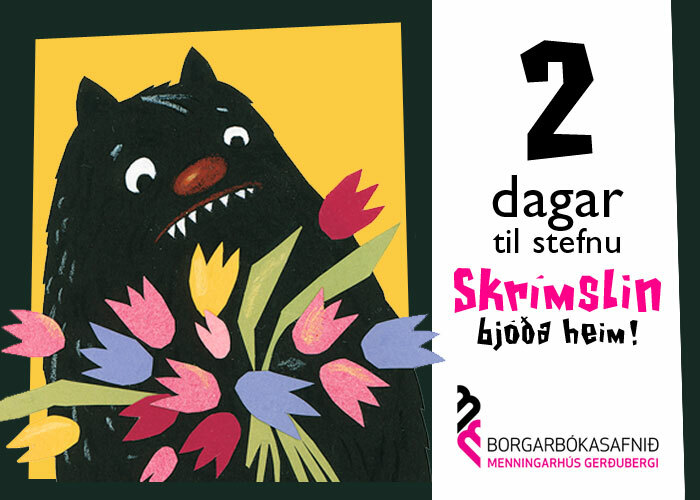 So, our Faroese friends of the two monsters may look forward to some exciting shows in Tórshavn in the coming months! See you in Tórshavn!